Although some would argue that Paris has been outshone by New York or Berlin when it comes to artistic vibrancy and invention, it's still a place where the arts are revered and new talent is rigorously spotlighted. As a result, the finest museums in the French capital generally strive to both preserve and showcase artistic legacies and expose the public to exciting contemporary work. Housing some of the globe's most important and rich collections of fine art, sculpture, film, photography and other media , these Paris art museums are outstanding for their breadth, accessibility to all and historic importance. If you're particularly interested in contemporary art, be sure to also see our complete guide to the best modern and contemporary art museums in the capital. Also note that several of the museums are included on the Paris Museum pass, so it may be worth purchasing. In addition to holding countless masterpieces of pre-20th century painting, sculpture, drawings, and art objects, the Louvre is arguably a masterpiece in and of itself. One word of advice, though: tourists flock here in the millions each year, meaning that if you're crowd-averse, you'll want to avoid peak hours and months if you can. People often beeline straight for the Mona Lisa and the Venus de Milo and neglect to see much else, but I strongly recommend that you explore quieter, less crowded wings at the former palace and city fortress. 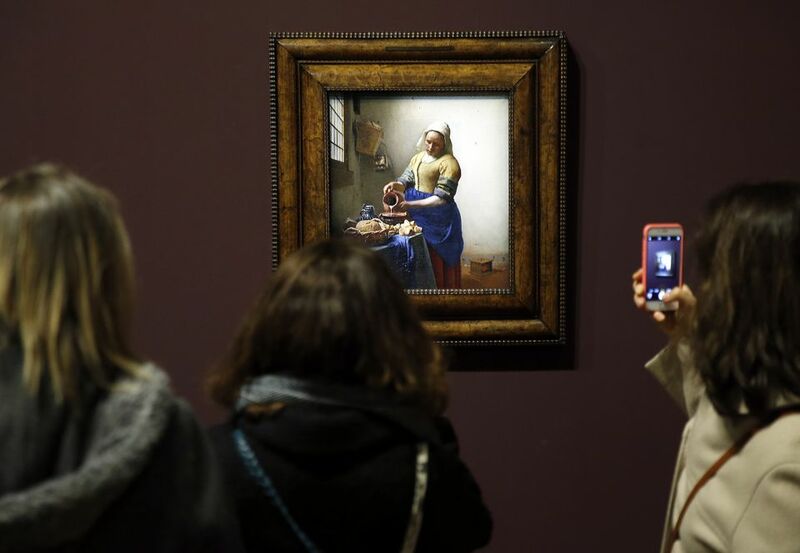 Some of my favorite works include chefs d'oeuvres from Dutch geniuses Rembrandt and Vermeer, Caravaggio, and Rubens, as well as the fascinating wings dedicated to Islamic and Egyptian art. The National Museum of Modern Art (MNAM) at the quirky, cheerful Centre Georges Pompidou houses one of the world's most important and prestigious permanent collections of modern art. Boasting over 100,000 works from key twentieth-century painters, sculptors, and architects including Picasso, Braque, Matisse, Miro, Magritte, Warhol, Saint-Phalle, Pollock, and countless others, the MNAM's main collection is constantly refreshed and recirculated. Thematic pathways through the collections are frequently changed up. This means that f you visit several times you're not likely to feel like it's a mere repeat each time. The temporary exhibits are almost always worth the ticket price, too. If you visit more than once per year, the annual pass is well worth it. Housed in an ornate old train station on the banks of the Seine, the Musée d'Orsay is situated just across from the Louvre, and effectively bridges the gap between pre-modern and modern artistic movements and traditions. Countless impressionist and expressionist masterpieces are held here, from Claude Monet, Edouard Manet, Vincent Van Gogh, Edgar Degas, Paul Gaugin and many other lesser-known but equally important modern artists. The Petit Palais, in close reach of the prestigious Avenue des Champs-Elysées, has a permanent collection boasting some 1,300 works from the antiquity through the early 20th century, with unforgettable paintings from the likes of Delacroix, Cezanne, Monet, Courbet, and many others. One of the best parts? It's entirely free. Temporary exhibits, meanwhile, are free for visitors under the age of 13. Contemporary art buffs are behooved to pay a visit to the city of Paris' museum of modern art, created in 1961 and housed in the distinctive Palais de Tokyo, itself opened during the 1937 Universal Exposition. Featuring over 8,000 works spanning all major trends in 20th and 21st century arts, the Museum of Modern Art of Paris hosts a constant stream of exciting temporary exhibits, more recently exploring the works of photographer Henri Cartier-Bresson and American artist Elaine Sturtevant. The terrace outside the palace affords a striking and head-on view of the Eiffel Tower. This museum dedicated to the medieval period-- exploring both art and daily life in the "Moyen Age"-- is one of the city's best, but is often overlooked. Housed in the striking Hotel de Cluny, a late 15th century Abbey, the museum is built above Gallo-Roman thermal baths built between the 1st and 3rd centuries-- parts of which can be visited. The permanent collection's "crown jewel" is a 15th century tapestry, The Lady and the Unicorn, much revered for its sumptuous colors and enigmatic allegorical symbolism. The grounds also include a garden meant to mimic medieval aromatic and medicinal gardens, providing a pleasant place to read or slowly stroll. This museum consecrated to French sculptor Auguste Rodin is one of Paris' finest, and offers a multifaceted look at Rodin's complex body of work, in addition to works from his brilliant student Camille Claudel, among others. In addition to iconic works such "The Thinker", the museum hosts an extensive sculpture garden that's a true pleasure to stoll, or think (as it were) in. Anyone wishing to understand Paris' multi-tiered, complex history would do well to pay a visit to the Carnavalet Museum. Housed within the walls of two Renaissance-era mansions, the Hotel de Carnavalet and the Hotel Le Peletier de Saint-Fargeau (built in the 16th and 17th centuries, respectively), the Carnavalet Museum's permanent collection traces the history of Paris across over 100 rooms. This exhibit is free of charge to all visitors, and arguably tops the list of Paris' free museums. The museum also hosts a series of temporary exhibits highlighting various periods or aspects of the Parisian heritage. Situated on the stately grounds of the Luxembourg Gardens, this museum is one of Europe's oldest, and was opened in 1750 as France's first state-run collection of paintings. It hosts a small number of temporary exhibits per year, but these are almost always highly anticipated and popular with the general public. Exhibits in recent years have focused on artists including Modigliani, Chagall, Vlaminck, and Fragonard (a painting from the latter is pictured above). This is another lesser-known gem in the Paris arts scene that focuses on masterpieces in 18th century painting. Housed in a 19th-century private mansion, the Jacquemart-Andre museum was founded by art collector Edouard André and focuses on works from French painters including Jean Marc Nattier, Elizabeth Vigée-Lebrun, Fragonard or Jacques-Louis David. Also see our guide to weird and eclectic museums in Paris, from catacombs to museums of magic and automata. Then check out our guide to the best things to do in Paris when it's rainy out. Only got 24 hours to visit? Peruse our step-by-step guide to what to see and do in only a single day in Paris.